The 2017 Jeep Grand Cherokee Trailhawk Review: At a time when American roadways seem to be overflowing with crossover vehicles, ones that visually project toughness without actually being SUVs, it’s refreshing to drive one with some authenticity. The Jeep Grand Cherokee is nothing if not authentic. This is a vehicle that has always offered a breadth of capability that few can match. It’s clearly a luxury vehicle with creature comforts and buttery smoothness for drivers who want to pamper themselves in a leather and wood cocoon. But it’s also a Jeep, with all the mountain-climbing, river-fording imagery that name inspires in the imagination, if not suburban reality. And while every Jeep is engineered with some level of outdoor adventure in mind, this year there’s a new version of the Grand Cherokee designed for drivers who want to use their Jeep as God intended, probing its limits on the trails. 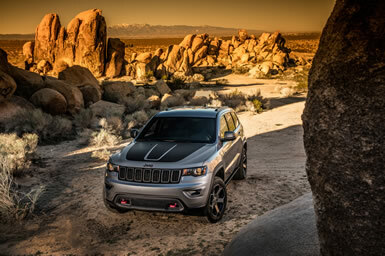 The Grand Cherokee Trailhawk pushes this vehicle’s considerable capabilities even higher, literally. Its standard height-adjustable air suspension provides almost 2 inches extra ground clearance compared with the base Ground Cherokee, along with more articulation and suspension travel for climbing over ruts and boulders. Jeep’s Quadra Drive II 4x4 system, an electronic limited slip differential in the rear, beefed-up skid plates and 18-inch Kevlar-reinforced off-road tires add to its legitimacy. Eye-catching red tow hooks and a matte finish hood decal make it look the part, too. Obviously, designing a vehicle for off-road travel means it’s got to make compromises on the pavement. The Trailhawk package definitely rides rougher and transmits a bit more road noise into the cabin compared to other versions of the Grand Cherokee, so it’s not the package I’d buy if I planned to use it for long highway trips. The new, luxurious Summit trim, with its quieter ride and electronic noise cancellation system, is better suited to that task. But for people who love off-roading on the weekends and still want to drive their Jeep daily, the Trailhawk keeps the compromises to a minimum. It’s optimized for the trails but still very livable, if not downright comfortable, for commuting and family-hauling duty. But Jeep has also been indulging enthusiasts with its high-performance SRT versions of the Grand Cherokee that show it can be capable on the race track, too, with a lower suspension and incredible power under the hood. As if the SRT wasn’t fast enough already, Jeep is also launching the long-rumored Grand Cherokee Trackhawk for 2018. It shoehorns the 707-horsepower Dodge Hellcat engine over the front axle and sends the power to all four wheels. Jeep claims it makes this the fastest SUV in the world, with a 3.5-second 0-60 time, an 11.6-second quarter-mile time, and a top speed of 180 miles per hour. And that gives the Grand Cherokee the most wide-ranging capability I’ve ever seen from one vehicle. From a luxury tourer to off-road champion, and now even going 180 mph on the track, this Jeep doesn’t just look impressive. It’s for real. What was tested? The 2017 Jeep Grand Cherokee Trailhawk 4x4 with a base price of $42,995. Options on the test Jeep: The Customer preferred package for $2,695, active safety group for $1,495, Mopar rock rails for $895, U-Connect 8.4 Nav for $450 and side spot and cross path detection for $595. The total MSRP price as tested including the $995 destination charge came to: $50,120. The Bottom Line: The 2017 Jeep Grand Cherokee Trailhawk. The new Trailhawk edition enhances the Off-Road credentials for this premium Jeep. A hood decal and red tow hooks are the instant giveaways that this Grand Cherokee is the beefed-up, off-road-ready Trailhawk model, which is new for 2017. Plus another new model is the Grand Cherokee Summit, with quilted leather seats and a quieter, more luxurious cabin. It’s interesting to see how much Jeep is showing off this chassis’ strengths in different ways. Both the Trailhawk and Summit are spotlighting the two extremes of its personality through custom tuning: luxurious silence on the Summit, and X-Games thrills with the Trailhawk. And maybe, just for those reasons alone, you should “Drive one, Buy one, Today ©”.